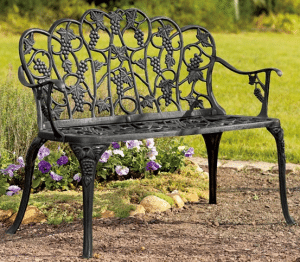 Looking for that stopping stop in your walk in your yard, this selection of garden metal benches from Plow & Hearth.com will fill many wish list of homeowners. They will provide a sitting bench that can be moved easily and match most garden decors. 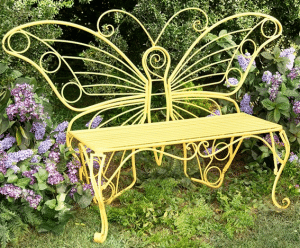 If you are looking for a different flair the colorful Butterfly bench will really stand out. Little care will be needed for these benches, just have to watch the paint for cracking or peeling to make sure you do not get any rust going. Getting some cushions will make for some long term sitting, reading a book or having that glass of wine watching the world go by. Now lets look at some of the details of each of these benches. Made from a combination of a steel frame and cast iron back the powder coated deep bronze finish will look great. The scroll work in the back will give you a design that will fit along your path. The bench is 50 inches wide, 17.5 inches deep and 34.5 inches tall. Seating capacity is stated at 280 pounds, some customers have used it for more weight. Easy assembly, will require cushions for long term sitting. The gentle scrolling vines work well with the humming birds drinking from flowers is very outdoor like. Has tube iron frame and cast iron back. Has a black painted finish. This bench is 50 inches wide, 17.5 inches deep and 34.5 inches tall. Easy assembly, two people can put together in about 15 minutes depending on skills with tools. Some state the enclosed tools are too big to fit in the space for assembly. 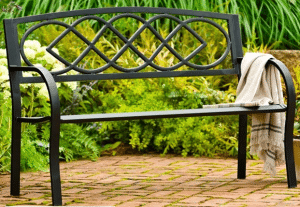 This bench is made from cast aluminum, is will never rust like the iron or steel ones. The powder coated finish is available in white or black. The back, legs and arms have a grape and grape leaf pattern. I have a similar white bench in my front yard. I have had it for over 40 years. It has been repainted several times and the legs have been repaired. It is still a great place to stop and relax outdoors. The bench is 41¾ inches wide, 20¾ inches deep and 33½ inches high. The aluminum is very durable in the outdoor environment. Easy assembly, need to make sure the correct screws are used in assembly. Looking for more colorful flair for your outdoor seating that looks more like a piece of art, look no further that this butterfly bench. Available in three bright colors, Yellow, Red and a bright White this bench will really add some color to your outdoors. The metal frame will have a powder coated finish and a beautiful butterfly back. This bench has no arms. This is the biggest bench in this article at 64 inches wide, 19 inches deep and 40 inches tall. Easy assembly, can be used for an indoor bench also. Looking for a simple and more modern design in your outdoor garden seating, this bench will work for you. The tubular iron frame and cast iron back has a durable painted surface that looks like antique bronze. Easy assembly. The bench is 50 inches wide, 17.5 inches deep and 34.5 inches tall. Seating capacity is 280 pounds. 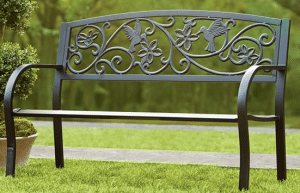 I have a given you five different designs for garden metal benches. I like having one of these on my pathway or you can use it in your home for extra seating and it will give you some extra style. If you need some bench cushions I have some choices here. Each one has a different style or the butterfly bench you can choose from three different colors. I hope that you find this information helpful. If you have any questions or comments, please use the forms below. 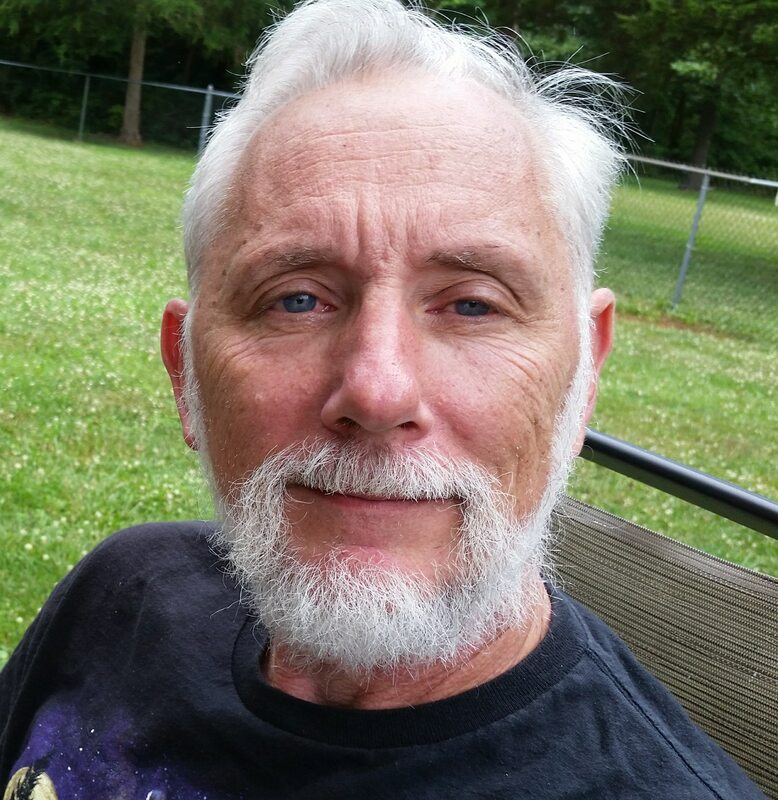 IF you would like more information on an item or would like to see me write an article about something, send me an email and I will get back to you. I am a big fan of the Celtic knot metal bench. Maybe it is the Irish in me. For only 100 bucks that is not a bad deal. 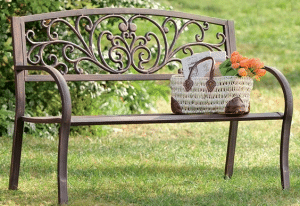 The Celtic Knot is a very simple metal bench for under the $100. I have the grape bench in my front yard. These really are some great looking benches, with the exception of the butterfly bench but I’m a guy so I guess it would be a hit to my ego to own that one lol. Thanks for the info! The butterfly is a little on the girly side. The bright colors will really stand out in any outdoor decor. I am a fan of the simpler styles. I do have the grape one in my front yard, it as used for my high school pictures in the 60’s. They will last a long time if properly taken care of.